I am converting my self-published books about American silverplate to digital form and making them available here. This information is free. Click on the booklet name to open a pdf file. You can read it on the screen or print it out. You can also save it to your own computer and share it with others. Always credit the source. Do not use it for commercial purposes. The story of the Oneida utopian community of Perfectionists and their leader John Humphrey Noyes. How they got into the silver business. Why Pierrepont Noyes created the Community line of flatware and what he did to ensure that it succeeded and endured. 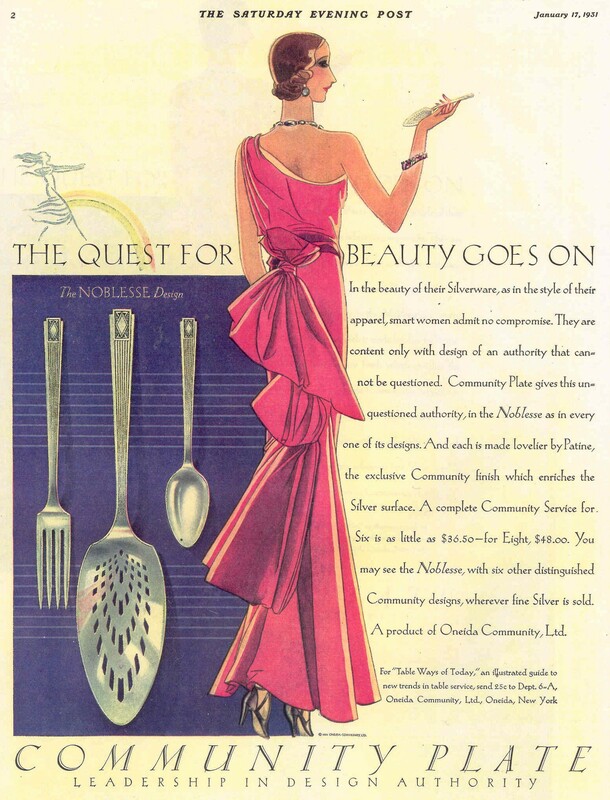 Learn how Oneida promoted its Community line of silverplate. 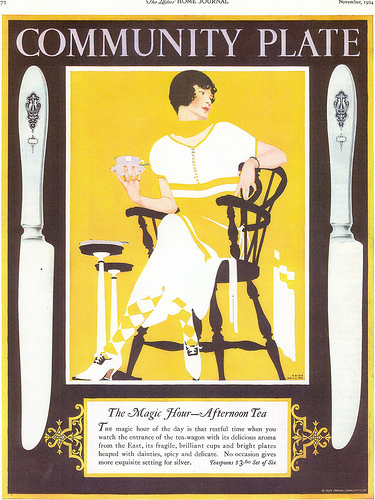 Their marketing techniques included pattern design by artists, extensive advertising with exceptional graphic artists like Coles Philips and Jon Whitcomb, celebrity endorsements, accessory items, and more. Silver manufacturers offered a multiplicity of pieces for the well-set table. This booklet describes the pieces in use between 1890 and 1940, with illustrations drawn from manufacturers’ catalogs, as well as a listing of alternate names and measurements. Yes, that’s me and this is a brief (and illustrated) account of how I came to collect all the source documents and stuff I used to prepare the American Silver Booklets I now offer free on the Internet. Mostly this not about me, but about Oneida Community. 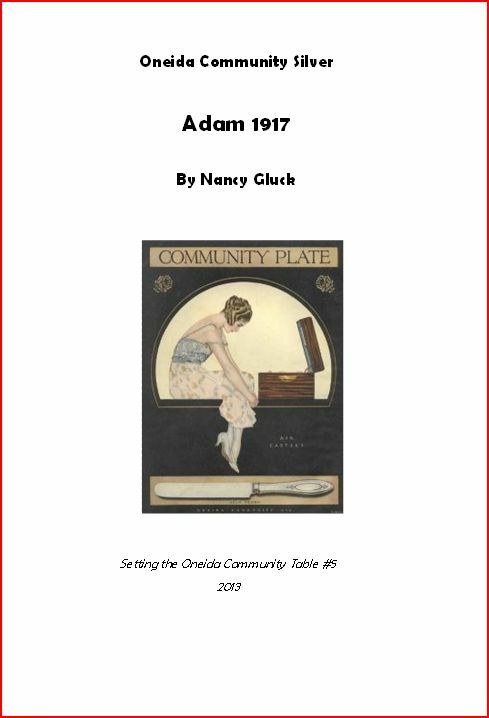 Complete documentation of Oneida Community’s 1917 Adam flatware pattern with a listing of all the flatware pieces available in that pattern. The booklet includes design elements, a description of hollowware and china made to go with the flatware, advertising and catalog pages. 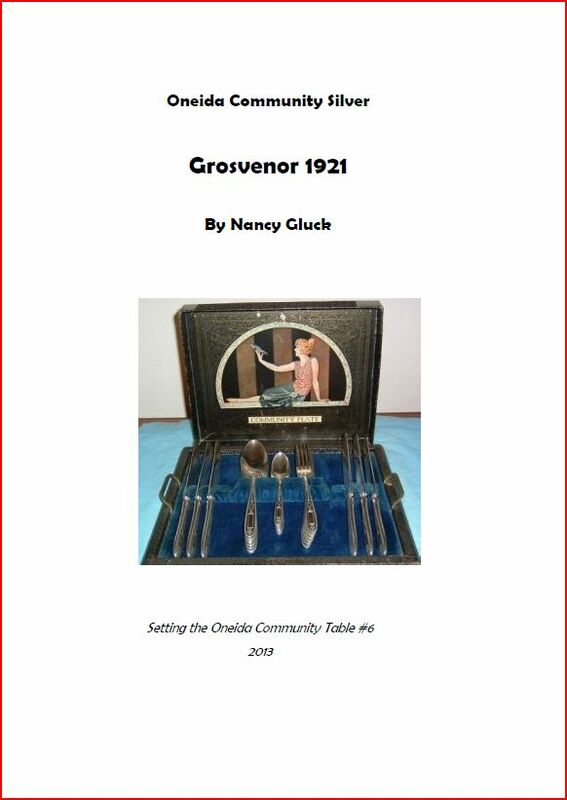 Complete documentation of Oneida Community’s 1921 Grosvenor pattern, with a comprehensive list all flatware and hollowware pieces offered in the pattern. Includes china and crystal made to match the pattern, as well as advertising and catalog pages. 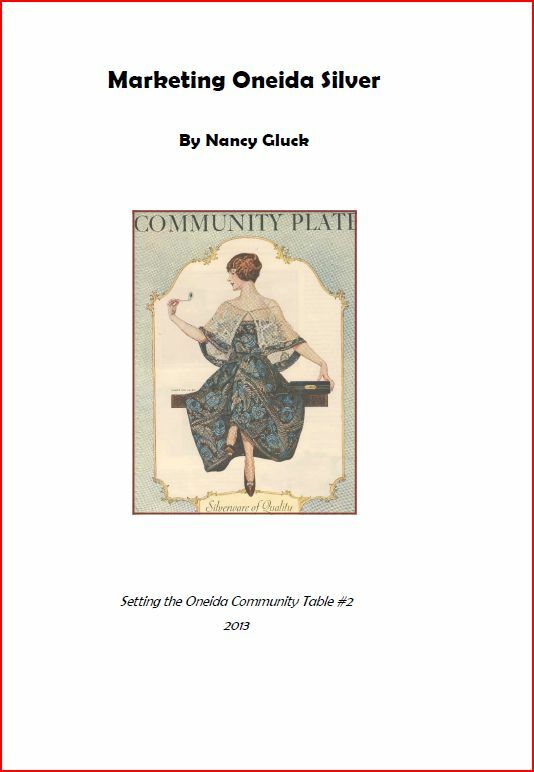 Complete documentation of the 1923 Bird of Paradise pattern, in which Oneida Community offered a full range of flatware and hollowware pieces. Booklet includes comprehensive lists of pieces offered in the pattern, as well as advertising and catalog pages. One of the few art deco patterns offered during this period, in Deauville it was possible to set a complete table using flatware, hollowware, china and crystal all in this pattern. Booklet includes comprehensive lists of pieces offered, as well as pictures and examples from catalog pages and advertising. 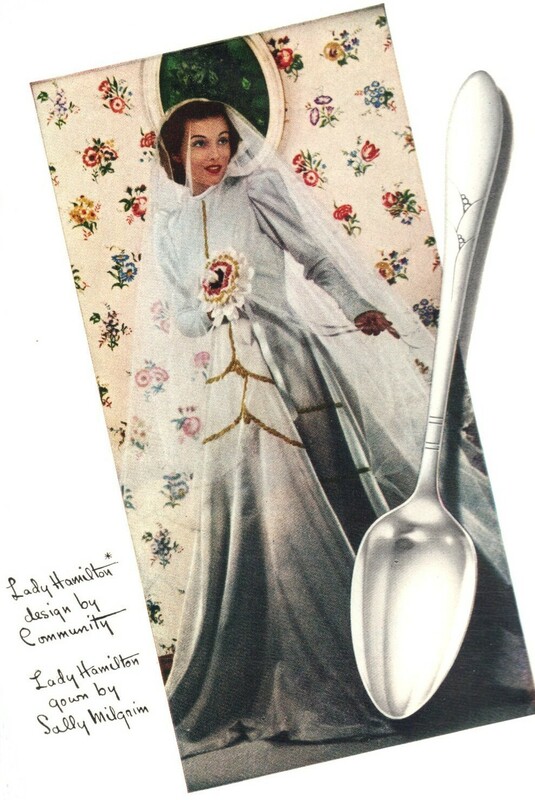 Communitys’ other art deco pattern in which Oneida offered flatware and hollowware, as well as two styles of china and crystal, to set a complete art deco table. Booklet includes comprehensive lists of pieces offered, as well as pictures and examples from contemporary advertising materials. This quiet modernist design had a long run of production, from 1932 to 1956. Oneida offered two different china designs as well as a crystal design in the pattern. Booklets includes colorful advertising from the period as well as lists of pieces offered in the flatware, china and crystal. A popular pattern available in silverplate, stainless steel, hollowware and china, its pierced design was inspired by the carvings of Grinling Gibbons at Hampton Court, the name under which it was sold in the United Kingdom and the Commonwealth nations. Booklet includes listings of new and old production, catalog pages and advertising. 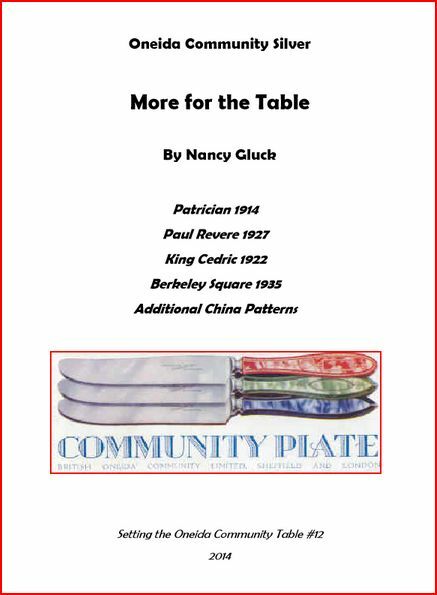 The patterns included are Patrician 1914, Paul Revere 1927, King Cedric 1933, Berkeley Square 1935, as well as additional china patterns. This booklet provides information about accessories offered by Oneida for the patterns listed. 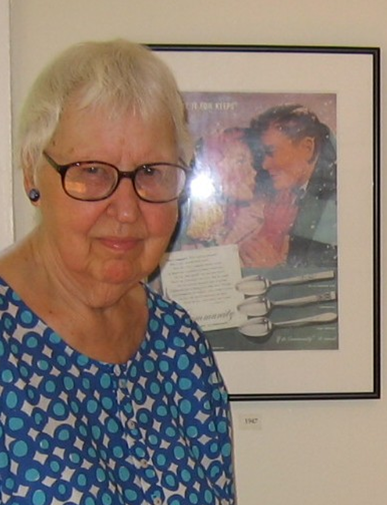 Nancy, thanks for putting all the Community information on the internet! I wanted to mention that I have the baby cup in the Lady Hamilton pattern and it’s a plain cup with the Lady Hamilton handle. It’s marked on the outside bottom as follows: “Lady Hamilton” in small block letters, the “Community” logo below that in the post-war script style, and “EPNS” in block letters below that (which I understand means “Electro Plated Nickel Silver”). It’s definitely an authentic Community piece and not an aftermarket item. And it was made after the war, from what I can tell. I can send you pictures, if you like. Thank you for the information. I know that Oneida offered baby cups in several patterns for which they did not otherwise make hollowware, so I am not surprised that they did so for Lady Hamilton. Have you done any research on the Patrician pattern? I have some pieces with a beveled bowl; most of what I’m seeing on the Internet seem to have simple bowls instead. Is it just bad photography, or has the beveling worn down over years of use, or was the bevel a differentiation within the run of the pattern? I think what you are calling a beveled bowl is a fruit spoon. 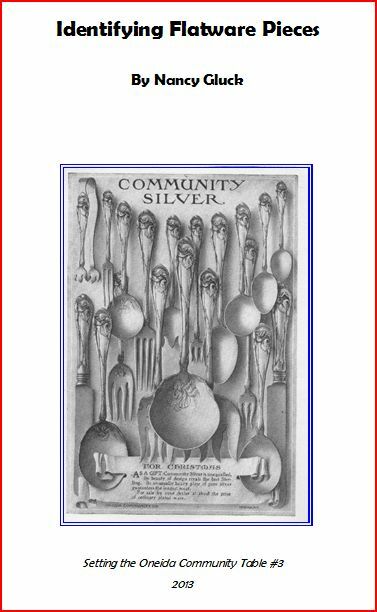 In my silver booklets, look at the one entitled Identifying Flatware Pieces for more about fruit spoons. Also, take a look at the pieces listed and illustrated for the Deauville pattern in that booklet. It is my belief that Oneida used the Patrician blanks to develop the Deauville patterns and the same pieces were offered in both patterns. Fruit spoons are rarer than teaspoons; they are usually the same length (although the fruit spoons may be shorter in older patterns), but the shape of the bowl is definitely different. There is some general information about Patrician in the booklet entitled More for the Table. One crabby remark: people offering flatware pieces on ebay often describe them inaccurately. I will be in touch by email with some suggestions. Your blog is now on my favorite sites page. I want to put some of the books on a separate page of my site. The people that visit my site will love your books. It may take a while for me to know learn how to set up free downloads of your books. I used to sell by self-published books by mail, and of course that involved printing, binding, etc. Since I don’t want to do that any more I make them available to download for free. After downloading you can view on screen or print, but I do not want the content sold. Making information available to your customers is fine, so long as you don’t profit from it. I note that your website does not offer much in the way of reference information. I suggest a link to my blog, as well as a link to any of the silver booklets. The page you show is from a wholesale supplier’s catalog. I have seen several of these and they are very useful in documenting the pieces made in a pattern. At my blog, I have a page devoted to catalogs: https://silverseason.wordpress.com/american-silverplate/learning/catalogs/. 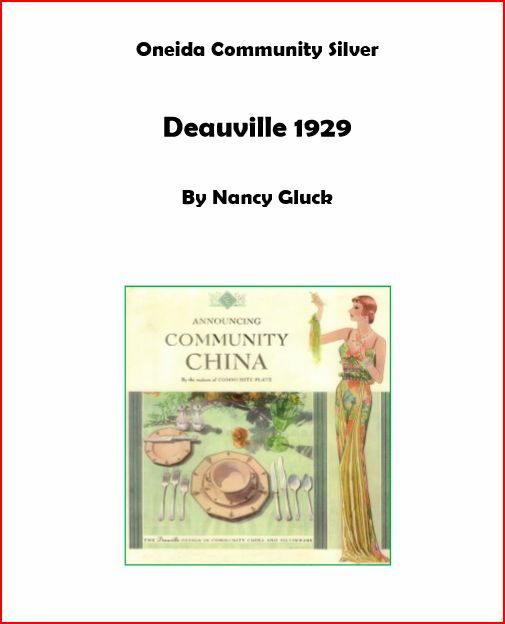 The Johnson catalog contains some very nice pages devoted to Deauville which you can download and print. There may be Deauville material in the other catalogs also. Just returned from a visit to the Mansion. Very inspirational and I’m now reading historical accounts of the Community. Coincidentally, I have dozens of sets of Community flatware and I am very happy to find the booklets. I’m particularly fond of the Coronation pattern, looking forward to the release of the booklet. I’m glad to hear your find the silver booklets helpful. The Coronation one should be out soon. That is great to hear. I’d be very interested in learning the reason for the Hampton Court name change. I’ve never been able to understand why the name is different in Britain and who decided to change the name. I’ve read some speculation, but it would be nice to have an authoritative explanation. Again, thank you for your work! It’s up now, in the American Silver Booklets list. If you go to my current post https://silverseason.wordpress.com/2014/05/21/coronation-1936/ I also have a link to an interesting page with some speculations about the two names.